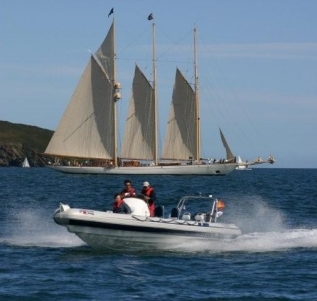 Cornish Cruising have added charter ribs to the charter fleet. Our RIBs have fun written all over them. They are family boats ideal for beach hopping, skiing, exploring, fishing, swimming, snorkelling or just sun bathing. They are a favourite for every occasion. The Ribeye brand has an excellent reputation. Ribeyes are renowned for their reliability and for the quality of build and fit out. All our RIBs are rigged at the Dartmouth headquarters where quality control is paramount. The A Series (600) and the S Series (785) has a genuine deep V load carrying hull. Designed to cut through the impact of the waves, giving a smooth comfortable ride. Like all Ribeyes, they handle superbly and are easy to manoeuvre at speed. The Ribeye Rib is practical and safe. It offers a very dry ride and is reassuring and forgiving to drive. 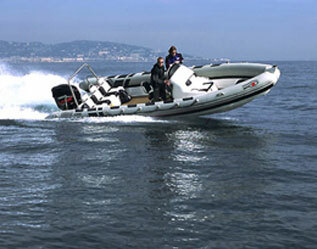 It is an ideal boat for a driver with minimal experience. * Fuel is not included in Charter Price and is charged at Pump Prices.